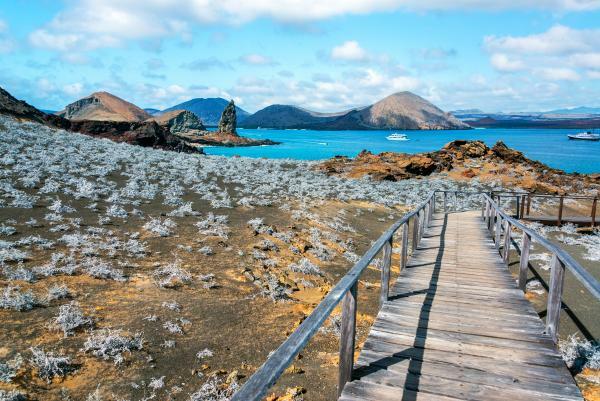 This 15-day Southern Islands Galapagos cruise on the ship, San Jose, explores the wildlife-rich shores of San Cristobal, Espanola, Floreana and more! Observe many unique and rare bird species, swim with sea lions, investigate amazing lava flows, and snorkel with beautiful tropical fish. Arrive in San Cristobal and be escorted to the ship, the San Jose. Head to the Interpretation Center in the afternoon, where you can learn all about how the islands were formed, ocean currents, the arrival of different species in the Galapagos, and many other natural circumstances that have made the Galapagos Islands what they are today. This morning, relax, swim, and snorkel in the beautiful Gardner Bay. You may even be able to observe sharks in the crystal clear waters. After lunch, visit Suarez Point. This rocky area sustains one of the most varied and impressive colonies of sea birds in the Galapagos. Climb the high cliffs to get a spectacular view of the soaring birds, and the blowhole that spouts water up to 75 feet into the air. 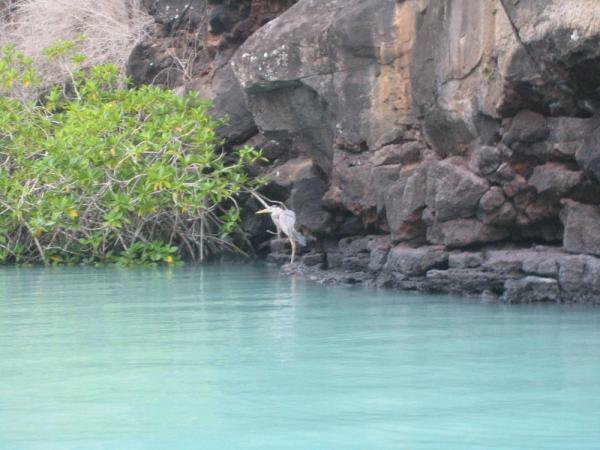 Start your morning with a visit to Cormorant Point, where you can observe one of the best flamingo lagoons in the Galapagos. The lagoon is situated between two tuff lava cones that give the area a special atmosphere. Besides flamingos, you may also see common stilts, white-checked pintails and other migratory birds. Then walk along two distinct beaches. One is a green-colored olivine beach, and the other an iron-red beach. Begin the afternoon in Post Office Bay, where British whalers set up a barrel as the island's post office. The tradition continues today, and you could even send a post card home! Then head to Baroness Lookout, which offers one of the most beautiful views of the Galapagos. 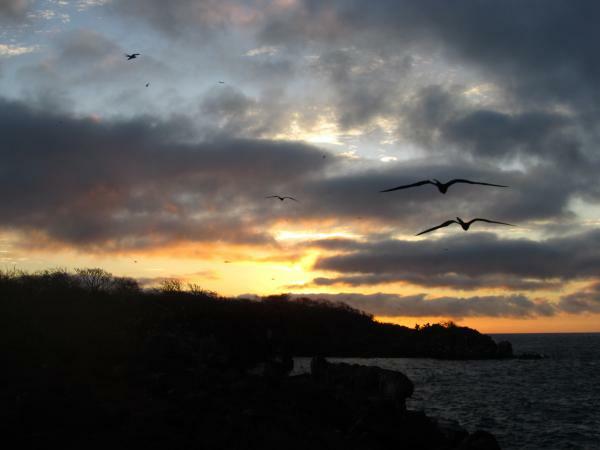 Start your day in Sullivan Bay on Santiago Island, one of the most amazing volcanic sites in the Galapagos. Walk around the remarkable lava flow and admire the amazing geological formations that have created Santiago Island. Then head to Bartolome, where you have the chance to enjoy a beautiful view that includes volcanic cones, lava fields, lunar-like craters, and the famous Toba formed pinnacle eroded by the sea. 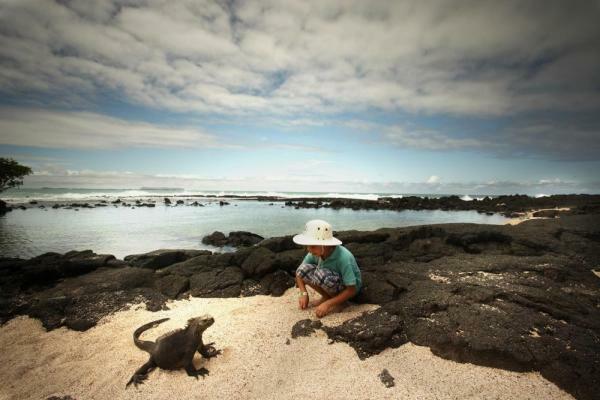 Bartolome is also home to two breathtaking beaches where marine turtles and a small colony of Galapagos penguins live. Spend the morning in Black Turtle Cove, a gorgeous red mangrove lagoon. Since the lagoon is so quiet and clam, it is the perfect place for shark and ray nurseries. The clear waters allow for great views of golden rays, spotted eagle rays, sea turtles, pelicans, herons, and white-tip reef, black-tipped, and hammerhead sharks. In the afternoon, head back to Santa Cruz and relax on Bachas Beach. Walk along two soft, white beaches and look for sea turtle nests. Behind one of the beaches is a beautiful lagoon where you may spot flamingos, black-necked stilts, whimbrels, and and other coastal birds. Start today with a zodiac ride to Isabela. Travel through Tintoreras where you may observe white-tipped reef sharks, lava herons, Galapagos penguins, and sea lions. In the afternoon, visit the wetlands close to Puerto Villamil village. Visit lagoons, swamps, and mangroves to observe many incredible species of migrant birds. Also visit the Arnaldo Tupiza Breeding Center to learn about the breeding, rearing, and protection of giant tortoises. Start the day with a walk around the West coast of Isabela. Start at Moreno point and stroll around a trail that follows a pahoehoe-lava flow into a complex of beautiful coastal lagoons full of different bird species. After lunch, take a zodiac ride along the cliffs of Tagus Cove and look for the Galapagos penguin, the flightless cormorant, and other sea birds. Then take a 30 minute hike to a cliff, where there is an excellent view of several volcanoes and Darwin Lake, an uplifted ultrasaline lake. Today begins with a trip to Espinoza Point on Fernandina, where you may closely observe many of the unique species of the Galapagos, including marine iguanas, flightless cormorants, and Galapagos penguins. In the afternoon, sail to Vicente Roca Point in Isabela. Take a panga ride and observe impressive geological formations including volcanic tuff cones and a large cave. Scan the cliffs for a variety of nesting birds such as Nazca and blue-footed boobies, storm petrels, gulls, and brown noddy terns. Also be sure to look into the clear waters for sea turtles. Vicente Roca Point is an excellent area to snorkel. If you enjoy snorkeling, put on a wetsuit and swim around with Galapagos penguins, sea lion, sea turtles, and other marine life. Spend the morning searching for nesting marine turtles and exploring the palo santo forest on Espumilla Beach. Then head to Buccaneers Cove where you may enjoy great snorkeling, or walk around the beautiful area. After lunch, walk along the black beach of Puerto Egas where you may find sea lions and marine iguanas sunbathing on the rocks. The unique color of the sand on this beach is due to volcanic tuff deposits. Start today with a beautiful hike around the red beaches of Rabida. Walk along a trail to a coastal lagoon, where you may find a variety of land birds such as yellow warblers, doves, mocking birds, finches, and flamingos. The beach is often full of sea lions and is a great base for snorkeling. Enjoy the afternoon on Chinese Hat, a small islet near the Southeastern tip of Santiago Island. Chinese Hat is an excellent place to observe geological features such as lava tubes and lava flows, and is also home to many colonies of sea lions, marine iguanas, and Galapagos penguins. Today begins with a trip to the Charles Darwin Research Station, where you have the opportunity to learn about the protection and conservation of the islands, as well as the breeding, rearing, and protection of Galapagos tortoises. In the afternoon, venture around the highlands of Santa Cruz. Admire the rolling hills and extinct volcanic cones covered with grass and lush greenery year round. Also visit the Twin Craters and a local ranch where you can observe the giant tortoise species of Santa Cruz in its natural habitat. Spend this morning exploring North Seymour Island. Walk along a circular path that takes you through the island to a gorgeous, rocky shore where the waves crash with a silvery-blue color. While on the trail, look for blue-footed boobies, frigate birds, swallow-tailed gulls, and other amazing wildlife. In the afternoon, sail to Mosquera, an islet formed by a geological uplift. Here you will find a reef of rocks and coral as you walk along a great white sand beach. You may also find a population of sea lions, Sally light-foot crabs, and many species of shorebird. Today explore the island of Genovesa. In the morning, head to Darwin Bay, a favorite for birdwatchers. Here, you may see wandering tattlers, lava gulls, red-footed boobies, masked boobies, whimbrels, sharp-beaked finches, Galapagos doves, swallow-tailed gulls, and yellow-crowned, blacked-crowned, and lava herons. In the afternoon, climb Prince Phillip's Steps, where who can find a variety of birds nesting the the lava flows, including storm petrels and short-eared owls. You may also see large populations of red-footed and Nazca boobies hanging out in the trees. Start the day with a trip to South Plaza Island, where you may find large populations of Plazas land iguanas, marine iguanas, land iguanas, and hybrid iguanas, as well as many different kinds of tuna, iguana's favorite food! South Plaza is also home to a variety of sea birds, including Audubon shearwaters, red-billed tropicbirds, frigate birds and brown pelicans. After lunch, head to Santa Fe, where you may see many endemic species such as the Galapagos mockingbird, rice rats, two species of land iguanas, and the Galapagos hawk. As you walk along a beautiful trail, you may see many salt bushes, as well as giant prickly pear cactus. Take the opportunity to snorkel with playful sea lions and tropical fish in the clear waters of Santa Fe. In the morning, head to San Cristobal. Begin the day walking along the incredible beach at Cerro Brujo, which is composed of white coral and volcanic ash. Cerro Brujo is an eroded tuff cone that is partly composed of the a'a' lava type, creating a fascinating landscape. Here, you may find young sea turtles and rays, sea lions, warblers, finches, and many different sea birds. Then sail to Leon Dormido, an old lava cone that is now home to many birds such as blue-footed boobies, Nazca boobies, and frigatebirds. The snorkeling is phenomenal, with great opportunities to see spotted eagle rays, sea turtles, tropical fish, and the Galapagos shark. After this excursion, transfer to the airport for your connecting flight to either Quito or Guayaquil. 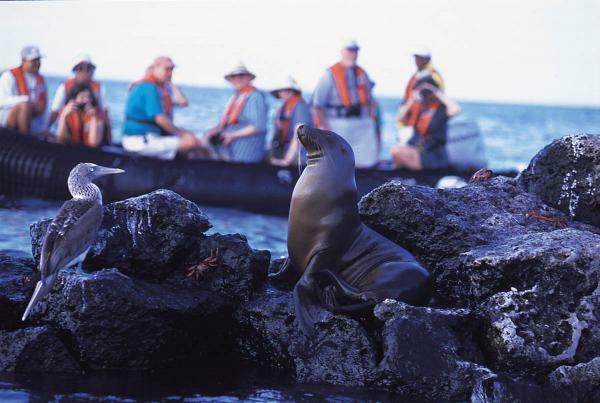 The San José was built in the Galapagos exclusively for Galapagos cruising. This spacious yacht allows all its passengers to have a private bathroom and great ocean views, and is built to fulfill your expectations of comfort, safety and service while cruising the Galapagos Islands. Cabins offer private bath facilities and ocean view. There are 8 twin cabins equipped with two twin beds. 4 cabins are on the upper deck, and 4 are on the main deck. The two twin beds can be pushed together to form one king bed. Children of all ages are accepted on-board but parents are held fully responsible for any accidents or damages. 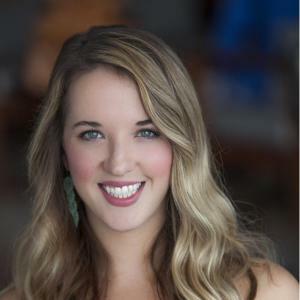 Initial deposit is 35%, and most travelers will call our office and pay the deposit with a credit card. Alternatively, you can register online here.